Our excitement level sky rockets! This set just keeps getting better and better! What other surprises do they have in store for us? We will see at the Midnight release party this Thursday, January 13th at D-Street in Orlando. Another detail released today is the Star Wars set is a parks exclusive. It will not show up on the online Disney Store or at Disney Stores around the country. Check out the complete blog post for yourself, and more pictures, here. Are you wearing a costume for the release event? Make sure to bring some doubles for trading as we all sit outside D-Street Thursday night. 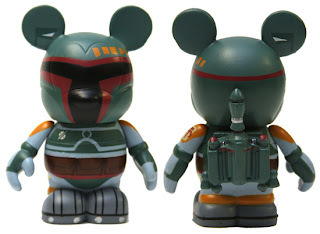 And I can’t wait to talk to everybody in line about Vinylmation. Destination Vinylmation is around for fans of Vinylmation, so we welcome your input.